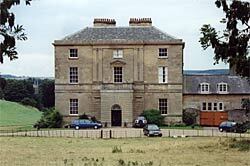 Papplewick Hall dates from the early 1780s and is probably the work of William Lindley of Doncaster (A Nicholson, 2003). THERE are many villages in Nottinghamshire the names of which form a clue to their age or history, and among these Papplewick holds a foremost place, for, if we accept the etymology of Mr. Flavell Edmonds, it signifies the dwelling place of Pappa, a Saxon chieftain, whose name occurs again in Papendyk, and also in Pappenheim, the latter being in Germany. 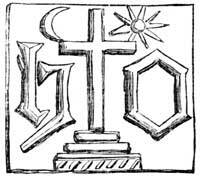 The termination wic, in Anglo-Saxon, signifies a dwelling-place. The name has undergone several transformations. In Doomsday Book it is called Papplewic, and three Saxon proprietors are named. In A.D. 1291 and 1341 it was written Papilwick, in 1540 Papelwyke, in 1634 Paplewick, and in 1709 Sir Theodore Colladon who then possessed the estate writes it Paplewigg. Since then it has regained its double p and is now written Papplewick. The old north road ran through the village, and near the site of the present Hall stood some cottages and an ancient hostelry, where the packmen from the north met those from the south to exchange their respective commodities. When this Inn was taken down, its cellars were carefully arched over, and are now buried under the surface. Along this old road Evelyn came Aug. 15, 1654 and writes thus. "We pass'd next thro' Sherewood Forest, accounted the most extensive in England, then Paplewick, an incomparable vista with the pretty castle nere it. Thence we saw Newstead Abby belonging to the Lord Biron, situated much like Fontainebleau in France, capable of being made a noble seate, accommodated as it is with brave woods and streames. It has yet remaining the front of a glorious Abby Church." No vestige remains in Papplewick of the Castle to which Evelyn alludes, but one field is still called the "Castle Field." Subsequently to Evelyn's journey a lady was travelling by the same road, (doubtless a bad one) when a wheel of her carriage needed repair, and while it was being mended by the village blacksmith, she sauntered about, until, coming to a stile which overlooked the beautiful demesne of Papplewick, she exclaimed, " If ever this place should be sold, I hope we may buy it, for I should like to live and die here." Her wish was fulfilled to the letter, for the remains of Lady Colladon were laid in Papplewick Church, and by the marriage of her only daughter with Mr. Charles Montague, the estate parsed into that family. In a faint pencil sketch dated 1742, dedicated to Mrs. Montague, (afterwards Mrs. Delany,) by M. Pendarves, the old Hall is represented with a tower. Was that "the pretty Castle" mentioned by Evelyn? Mr. Charles Montague's son Frederick replaced the Old Hall by the present mansion, indulging in the then novel luxury of plate glass windows. He acquired the title of Right Honorable by his connection with the Coalition Ministry. He was a man of literary tastes, and collected a large and valuable library. Amongst his intimate friends were Lord Rockingham, Sir Horace Walpole, Gray and Mason. A tablet in the Grounds with the initials "F. M." records the taste and skill which Mason displayed in their arrangement ending thus, "And taught one little acre to command, Each varied happiness of sun and shade." Mr. Montague recorded the naval victories of the period as they occurred by forming plantations bearing the names of the different commanders, and the achievements of Lord Howe, Earl Vincent, Sir John Borlase Warren and others were thus commemorated. Papplewick retained its "incomparable vista" till 1821, when the writer first saw it, but the fine old elms have gradually fallen or been removed, and the only portion now left is the private road to the Hall, a winter view of which is given on the precluding page. It was kindly drawn from a photograph by Mr. T. Barrett, of the Nottingham School of Art, and engraved by the Dallas-tint process. In an open space at the bottom of the village, midway between the "Griffin" Inn and the Smithy, stood a single tree surrounded by a seat, where, doubtless the old folks had congregated to hear and to tell the news. Great care was taken to preserve "Old Peter" but it decayed too fast, and was obliged to be removed. A little beyond the Blacksmith's forge stood the stocks, and a sister of the writer recollects seeing a man enduring the punishment, to whom some woman were administering consolation in the shape of draughts of ale. The stocks have long disappeared, but the Village Pound remains, though owing to better care and better fencing, its walls seldom enclose a stray tenant. 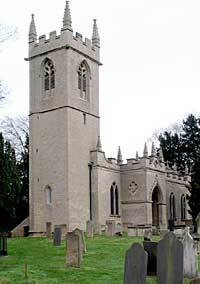 St James' church, Papplewick was rebuilt by Frederick Montagu in 1795 (A Nicholson, 2004). The Church stands apart from the village, within the precincts of the Hall Grounds. Unfortunately when The Hon. Frederick Montague rebuilt the nave, ecclesiastical architecture was at its lowest ebb, and only from the tower, built about the 13th century can we guess what the old Church may have been. Its ancient relics must have been ruthlessly mutilated or demolished. Some bits of painted glass still remain in one of the windows, in the right compartment of which is the figure of a saint, and part of the inscription containing the word "Steffa," is legible. Underneath that is the kneeling figure of a Knight in armour. In the upper part of the left compartment is a representation of S. Peter. A portion of the inscription which has been deciphered reads thus, "Anno Dm. Millimo C. C" the rest is apparently from another part of the window. Below this is a procession of monks, with a mutilated inscription. The faces of these from their individual character seem to have been portraits. The new portion of the Church was built in 1795. The only ornament in it, is the east window, containing the figures of Faith and Hope, copied from a portion of the west window in New College Chapel, Oxford, the designs being by Sir Joshua Reynolds. The tower contains three bells, the tenor bears the date 1620 and the following inscription in Old English. " I • sincerly • toling • men • do • call • to • taste • on • food • that • feeds • the • soule" The monogram is identical with the upper one at page 114, in the first volume of "Old Nottinghamshire" (here re-produced) proving it to be from the foundry of Henry Oldfield of Nottingham, and it was undoubtedly one of his latest castings as the date is 1620, the year of his death. Several years since, attention was directed to the subject of incised tombstones bearing emblems illustrating the occupation of the deceased. Two were mentioned as being in Papplewick Church, one evidently an archer's tombstone, another said to be that of King John's carver. The slabs were found and though worn down by age, the emblems were perfectly clear, and were then re-chiselled, the stones, (not from the vicinity,) proving so hard as to break the mason's tools. The archer's tomb bears the emblems of bow, arrow, baldric, and hunting horn. It now measures five feet five inches by three feet four inches, but as three steps of the "Calvary" or base of the cross have been cut away to.makc it fit into its present position, it must have been longer, and Throsby speaks of it being-six feet seven inches in 1795 The designs on the archer's tomb are very elegant, the knife or cleaver of the royal carver is more clumsy. No authority has been obtained to verify the conjecture that this slab commemorates the carver of King John, but as the office of "Trenchant Ecuyer" was one of distinction, and John was often in the neighbourhood, the appointment may have been held by an inhabitant of Papplewick, and the foliated cross seems to mark a man of high degree. The archer was probably an official of Sherwood Forest, or possibly one of Robin Hood's band, for a cave in the rising ground above the Hall is still called Robin Hood's stable, an engraving of which is to be found in Thoroton's Antiquities of Nottinghamshire, page 287.